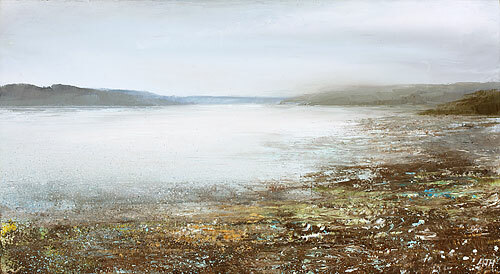 Sarah Wimperis and Amanda Hoskin continue the Contemporary Impressionism series of exhibitions, at Beside The Wave, with their own individual visions of the Helford River. 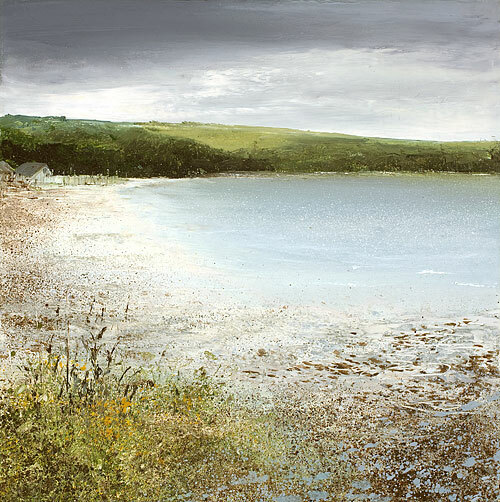 In this, Sarah's first major collection for Beside The Wave, works include the Helford (where she lives) come rain or shine, exquisite portraits of gardens and a rich collection of paintings from Sarah's recent visit to Provence - a welcome reminder of what a sun-drenched summer really looks like. 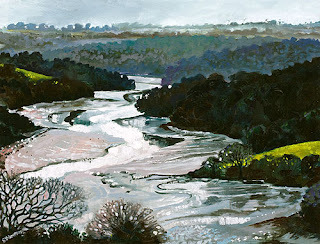 Meanwhile, with her epic painting journey around Cornwall done, Amanda has found inspiration further inland around the Helford River. 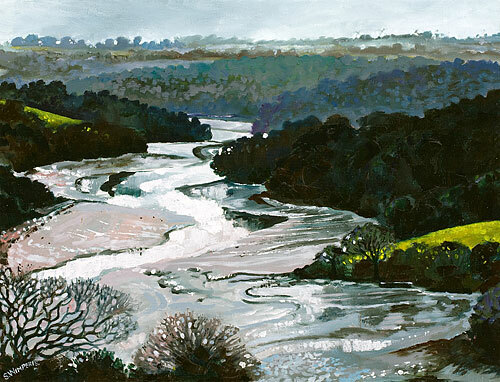 In painting the Helford for the very first time Amanda has sought to capture the essence of the river throughout the year. Paintings are made by coaxing misty shapes out of the paint, using her fingers and splattering subtle colours onto the canvas. Amanda often paints from memory or from sketch books and studies made outdoors working to create and communicate the spirit of place. Sarah paints as much as she can en plein air, or out there, in the rain, mist and sun, completing entire works of art outdoors. Her work seeks out strong colours, deep shadows and brilliant light, and she will often painting into the light ("contre jour") from the creek side or from her floating studio out in the river. ﻿﻿ For both Amanda Hoskin and Sarah Wimperis, the challenges of painting Cornwall in the winter, misty and moody with lush greens and subtle greys, and Cornwall in the summer, hazy sunshine, hot colours against deep cool shadows have produced breathtaking collections of work. And unsurprisingly, from the same stimulus of the Helford River each has such different and refreshing responses - which of course is part of what the joy of art is all about. Unique ways of seeing and utterly individual ways of voicing them. Hoskin. Rain Clouds over the Field. Helford. Sarah, meanwhile, has also spent some time this summer in Provence, painting en plein air and has filled the gallery with paintings of blue Provencal skies, terracotta walls and purple shadows and of course Lavender. Here you can see the process of painting, but you can't sadly hear the cicadas or feel the hot sun but clearly much of that has seeped into the paintings!!! Anyway, it's now time to go and hang these paintings on the wall so they can be there for all to enjoy! This exhibition opens on Saturday 6th August and continues until ﻿Thursday 18th August. This is the Blog of Beside The Wave, Cornwall's leading gallery specialising in contemporary art. Here you can find out about our artists and their art and what goes on behind the scenes of one of Cornwall's most established galleries. 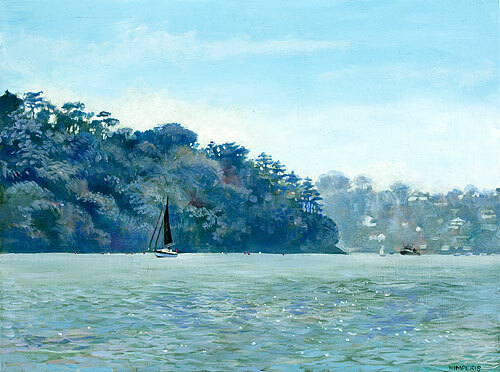 Based in Falmouth, Cornwall, we hold a large collection of paintings of place. Landscape, seascape, still life and interiors. We also show collections of work from leading jewellers and ceramicists.